Gardening is another one of my… well not passions, but certainly an interest. I love the idea of growing food for my family, but sadly I lack the motivation to keep up with the weeds and the watering so the results are never as good as they could be. Still I managed to get a few meals out the peas and beans (and most of the peas were devoured fresh by my children before they ever made it inside), and my garlic harvest (so far, I haven’t yet dug up the whole garlic bed yet) has had a 50% success rate. There were enough raspberries and currants for the kids to snack on, and we got 1 strawberry from the plant my son was given at school. There was plenty of silver beet (several meals worth still in the freezer). And we got to eat one or two lettuces before they went to seed. We have a small pumpkin (well technically 3 small pumpkins but the other two are miniscule and as the first frosts are coming soon they won’t get big enough to eat (I’m assuming…)) which should be enough for at least one meal – I’m hoping two. My four tomato plants that I planted, along with the half a dozen others that self seeded, have resulted in 3 tomatoes 😦 And the brocolli… well… I did get one feed of brocolli, but I’m thinking what I planted was something else – broccolini perhaps – because while it looked similar to broccoli it was definately not. What has surprised me though, are my carrots! 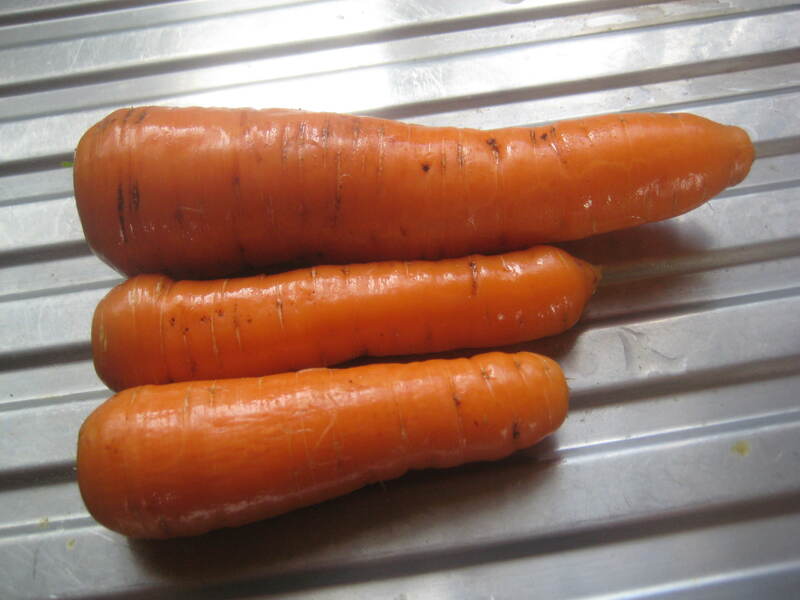 I’ve pulled out a few now – I’ve had the odd failure, things that are more the shape and size of a radish, but mostly they have been good, straight carrots, if a bit small. Yesterday I pulled a few more, another stumpy one, and some good ones. But then there was the big one – it looked a decent size from the top – but I just wasn’t sure. I thought I might get another stumpy one, so was preparing myself for the disappointment. they are beauties Heather. I often wish I had a garden. Only I can’t have a garden where I live. Oh well, I might one day.